Comodo Internet Security (CIS), the standard internet security edition from Comodo Group, which comes for free. This multi-layered security application keeps hackers away from accessing your personal information such as online passwords. It blocks viruses, Trojans, worms, spyware, zero-day attacks, buffer overflows, and other intruders, and gives you complete protection. Unlike other free internet security tools, Comodo Internet Security 2013 provides comprehensive functionality. The installation is ok and the interface is user-friendly but needs to be more attractive. There are five main modules – Summary, Antivirus, Firewall, Defense+, and More. 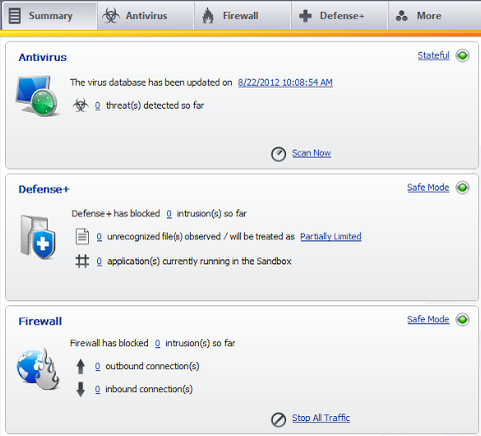 In “Summary” section, the status of Antivirus, Defense+ and Firewall modules are shown. You can start antivirus scan and stop all traffic through firewall directly from “Summary” module. You can jump to other modules and go into detail about their respective security options. 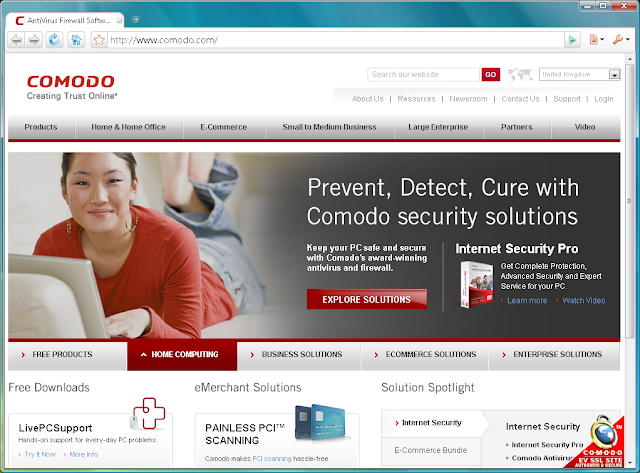 Comodo Internet Security (CIS) is available in three editions – Standard, Pro, and Complete. 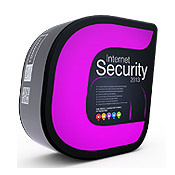 All three editions include a personal firewall which stops all unauthorized communication with the internet. The latest version Comodo Internet Security 2013 free edition 6.2 has added few enhanced features such as an advanced view of the home screen, multi-selection functionality on various grids, search button in all relevant grids, Full-Virtualized Auto-Sandboxing, improved GUI performance, improved touch screen, and other compatibility issues. The latest version gets better in security and usability in addition with cloud-based virus-scanning and behavior analysis of unrecognized files, which make it the most efficient security tool in detecting zero-day attacks. The cloud-based virus scanners will automatically detect and remove unknown and untrusted files. Thus, allowing only trusted applications to run on your computer. Auto-Sandbox Technology – This feature isolates untrusted programs like viruses and other malicious software from your computer, thus making it virtually operative. Default Deny Protection (DDP) – Identifies safe files and applications easily on your PC and denies other untrusted programs. Stops viruses and malware before they pierce into your PC via Prevention-based Firewall and Antivirus Protection. The Personalized Firewall adjusts according to your needs and quickly sets the rules for downloading software. Cloud-based Antivirus – This feature detects malicious files and programs even if the virus definitions are not updated. Detects Zero-Day Malware automatically via Cloud-based Behavior Analysis. Cloud-based Whitelisting – Easily identifies and lists safe/trusted files and applications. SecureDNS Service – Keeps your online secure by checking with a real-time blacklist of malicious websites. 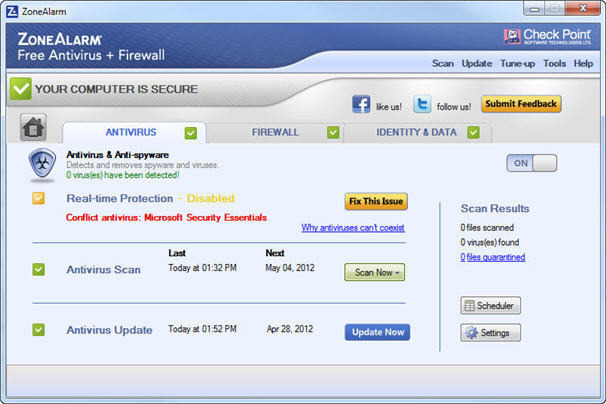 Detects and cleans malware infections in PC registry and disks via Spyware Scanning feature. Game Mode – The alerts, virus database updates and schedules scans are not operated while playing games. There are additional features such as Application Control, One-Click Virus Scanning, User-friendly Interface, Unique “slider” to change your current security level, and Exclusive access to Comodo’s “safe-list”, which makes Comodo Internet Security Free 2013 a must-have application for malware and spyware-affected computers. Download Comodo Internet Security 2013 Free Edition from its official website for free. It is completely compatible with Windows 8, 7, Vista, and XP OS versions. ZoneAlarm Free Antivirus + Firewall 2013 is one of the rare antivirus programs which has a personal firewall included, which protects your computer from viruses, spyware, Trojans, worms, bots, and rootkits. This is a complete internet security solution that has advanced features such as two-way firewall, traditional antivirus, anti-phishing, and enhanced download & identity protection. The premium version is available which contains parental controls, virtual browsing, PC tune-up and customer support. ZoneAlarm originally started producing security applications by “Zone Labs”, but later the company was acquired by “Check Point”. 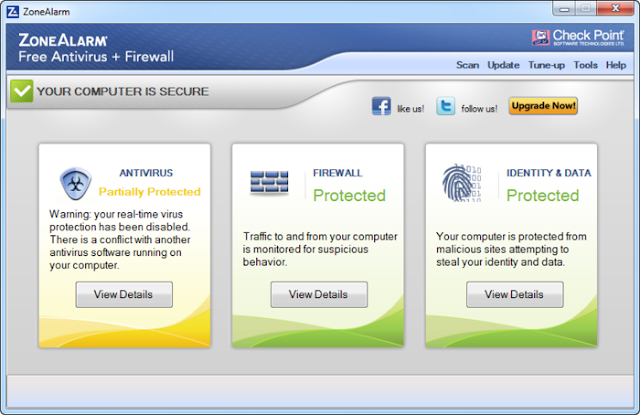 The latest versions of ZoneAlarm are Free Antivirus + Firewall, Internet Security Suite, and Extreme Security. The Extreme Security offers comprehensive security required for your PC and is recommended by many experts. The latest version 11.0 has updated antivirus engine and added improved Site Check technology and security toolbar instead of Forcefield. The installation is simple and the antivirus program updates to its latest virus definitions automatically when you complete the process. But, it is difficult to install ZoneAlarm Free Antivirus on malware-infected systems, thus making it less effective and also the boot time is slow enough on many systems. Antivirus & Anti-Spyware Engine – The behavioral virus detection identifies and removes many virus attacks whereas the Kernel-level virus prevention protects your operating system rigorously. Two-way Firewall – This firewall hides your system from hackers at the front door via Full Stealth Mode and protects from inbound and outbound attacks through “Threat Traffic”. Advanced Firewall – Monitors your computer behavior and blocks most sophisticated attacks whether they are traditional or newly emerging. The Advanced Firewall includes OSFirewall, Advanced Access Protection, Zero-hour Protection, Application Control, and Early Boot Protection to stop complicated assaults. Application Control – This feature blocks programs from malicious activities that are trying to access your computer. It prevents hackers from spoofing applications through program MD5 validation. Additional Layers – There are multiple security layers like Wireless PC Protection, Automatic Wireless Network Security, and DefenseNet provides further protection with real-time security updates. Do Not Track (NEW) – This new feature blocks data-collecting companies that gather your personal information for their business purposes. It also increases your internet browsing speed rapidly. Facebook Privacy Scan (NEW) – Examines your Facebook News Speed, photos, and videos, and delivers detailed instructions to tighten security. Advanced Download Protection – The Instant Security Check smartly analyzes the downloaded programs through your internet browser for malicious activity. The Deep Security Check runs the download process in an isolated environment, thus protecting your system from nasty behavior. Private Browsing - Ensures your web browser cache, cookies, history, passwords, etc. to be concealed from unauthorized activity. Privacy & Security Toolbar – Provides Site Check, Do Not Track, Facebook Privacy Scan, Private Browsing and more. Identity Theft Protection – The identity protection services which include Daily Credit Monitoring and Fraud Alerts, Victim Recovery, and Identity Lock keeps your sensitive information like credit card details, etc. private from authorized admittance. 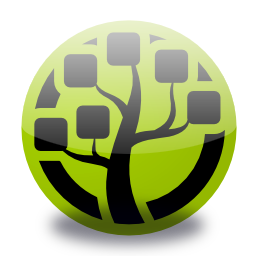 Online Backup – Provides 5GB free online storage space for backing up your data such as tax returns, photos, videos, etc. in case of loss, theft, or accidental deletion. The uploaded and downloaded files from the storage space are encrypted with a secure key and a password. 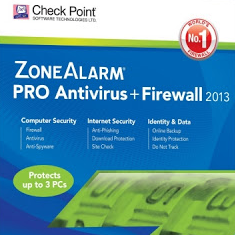 ZoneAlarm Free Antivirus Plus Firewall 2013 has top-quality firewall protection with a basic antivirus shield. As compared to firewall, the antivirus protection is a bit less proactive and offers only basic security. 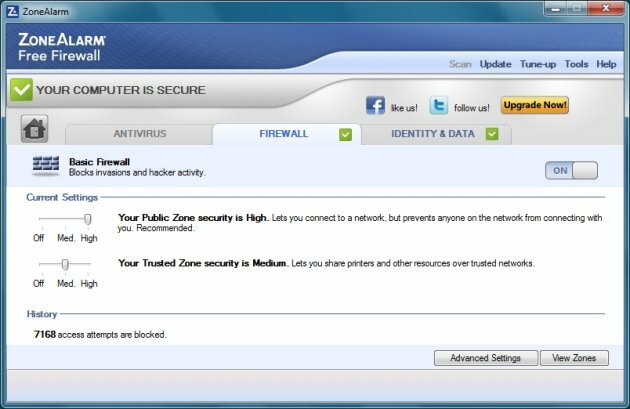 If you are looking for a free antivirus solution with a powerful firewall, choose ZoneAlarm Free Antivirus + Firewall 2013. PhotoScape is a free photo editing tool that helps users to edit photos easily with its basic manipulation tools and photo enhancements. The main intention behind developing PhotoScape is to provide users an easier and enjoyable way to edit photographs taken from their digital cameras or mobile phones. The user need not have to be an expert or even intermediary to use this graphics editing program. PhotoScape functions only in Windows operating systems and is compatible with Windows 8 as well. PhotoScape is developed by MOOII Tech, a Korean company. 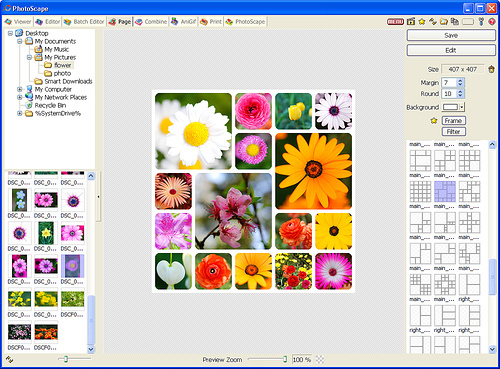 The current stable version of PhotoScape is 3.6 with additional language packages available for download, while the default languages are English and Korean. The latest version of PhotoScape 3.6.5 is free to download and is upgraded with few improved enhancement tools such as Blur Brush, Filter Speed, Color Temperature, JPEG quality, etc. The interface is very user-friendly with all the tools are available on the toolbar via the toolbar menu. The unique circular module selector is another interesting feature that displays the important tools which include Photo Editor, Viewer, Batch Editor, Page, Combine, Animated GIF, Print, Splitter, Screen Capture, Color Picker, Raw Converter, Rename, and Paper Print. The user can select an appropriate option and load the required image(s), to start the manipulation process. Resizing, brightness, color, white-balance adjustment, backlight correction, frames, balloons, text, drawing pictures, cropping, filters, red eye removal and blooming. Edit multiple photos simultaneously with Batch Editor. Combine or Merge multiple photos vertically or horizontally to create one photo. Create animated photo using multiple photos via Animated GIF. Split a single photo into several pieces via Splitter. Capture screenshots and save them via Screen Capture. 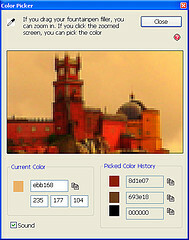 Choose a color from images via Color Picker by zooming in on images. Rename filenames of photos in batch mode. Convert RAW images to JPG via RAW Converter. Find similar faces on the internet using Face Search. Print lined, graph, music and calendar paper via Paper Print. Automatically resize all photos to the first image’s size. To create frames, borders, and collages there are various templates in the library. PhotoScape can’t give you all the required tools and options to enhance your photos completely, but its quality features will make you changes which saves a lot of time. This tool especially comes very handy for beginners who are looking for some basic features with quality output. Download PhotoScape 3.6 from its official website which is available for free. 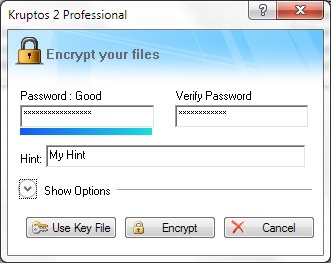 Kruptos 2 Professional is a simple yet powerful file security program that can be used to encrypt any file of yours that can be accessed only with the correct password. 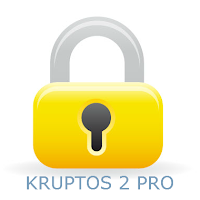 Kruptos 2 is a shareware encryption software that can protect all your files including photos, videos, credit card data, income/home tax returns, or any other sensitive file which is to be kept private. It encrypts your files with a strong 256-bit encryption algorithm which after cannot be read, modified or even accessed without a password. Kruptos 2 Professional is available for 30-day free trial or can be bought for $24.95. It is supported in Windows 8, 7, Vista, XP and 2003 OS versions. The latest version 3.0 is compatible with Windows 8 and has updated with a two-phase password & key file authentication. How Does Kruptos 2 Work? When you install Kruptos 2 Professional, the welcome screen starts counting down the limited free uses, as the application can be used for only 30 times, if you subscribe for a 30-day trial period. At the beginning of the Kruptos 2 application, a ‘Help’ file also opens with its ‘Getting Started’ page displayed. The interface is very user-friendly which is quite easy-to-use. The look and style are adapted from Microsoft Office and the toolbar provides you with options to Add Files/Folder, Encrypt/Decrypt, Shred, Change Password, etc. When you right-click on any file, you can encrypt, decrypt, shred, self extract, zip archive, email, and change password. The ‘Encryption’ window offers you to input their password with a ‘Hint’, when you forget it. You can also ‘Key File’ to encrypt your files. A ‘Key File’ is a file on a computer which contains encryption or license keys. The ‘Key File’ window lets you select a file as a key, in order to obtain a very strong password. The decryption process does the reverse job, i.e. decoding your file by specifying the correct password. Protect your private files which include photos, movies, documents, or others, with a 256-bit encryption algorithm. The encryption includes a password protection for Windows 7, Vista and XP users. For Windows 8 users, the application offers a two-phase authentication combining a password and keyfile. Easy-to-use once you install the application, with no complex options or settings. Lock your portable USB devices and its contents securely. Microsoft Windows Integration, allowing you to encrypt your files with just two clicks. Double-click Integration, will automatically re-encrypt your file when you have finished your work thus you don’t have to worry about your file being left unsecured. You can permanently delete any file via an ‘Inbuilt File Shredder’ so that no recovery tools could rescue them. Keeps your files locked up even if your computer is stolen or broken. 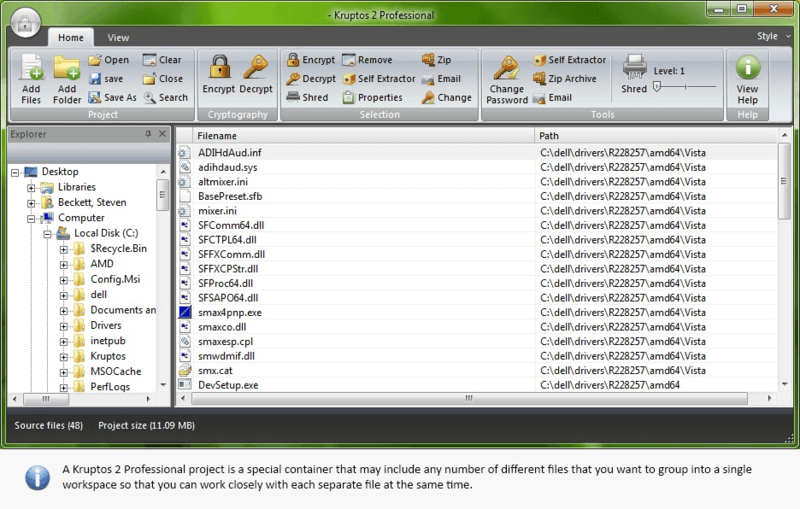 You can create encrypted self-extracting or zip files. You can send encrypted email attachments for additional security. Offers you a ‘Common Password Analyzer’ for analyzing the strength of your password. The latest version 3.0 has improved data safety that checks the data integrity when encrypting your files and also changed the way encrypted filenames are created. 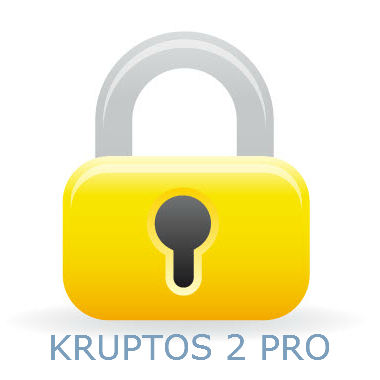 If you are looking a strong encryption security which the free encryption tools don’t have, you can try out Kruptos 2 Professional software. There are two more encryption softwares namely Kruptos 2 Go and Random which can protect your USB from data-theft or data loss and generates strong passwords for you with a combination of alphabets, numbers and symbols. There are various softwares to convert word, PowerPoint slides, images, web pages in PDF format, but we can also utilize online tools to perform those operations. 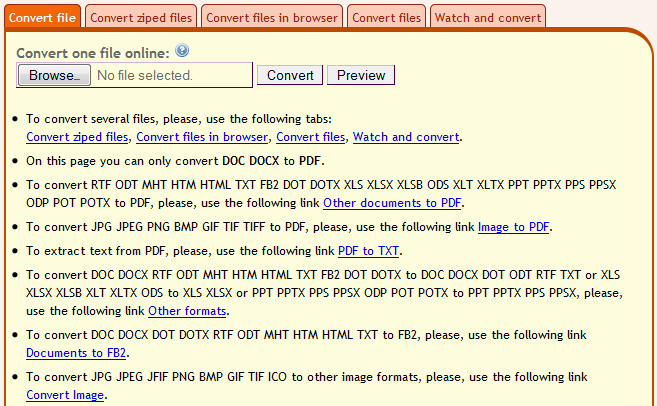 Some websites offer free conversion from/to PDF which are quick and reliable. These services are convenient to use making the work easy even for normal internet users. 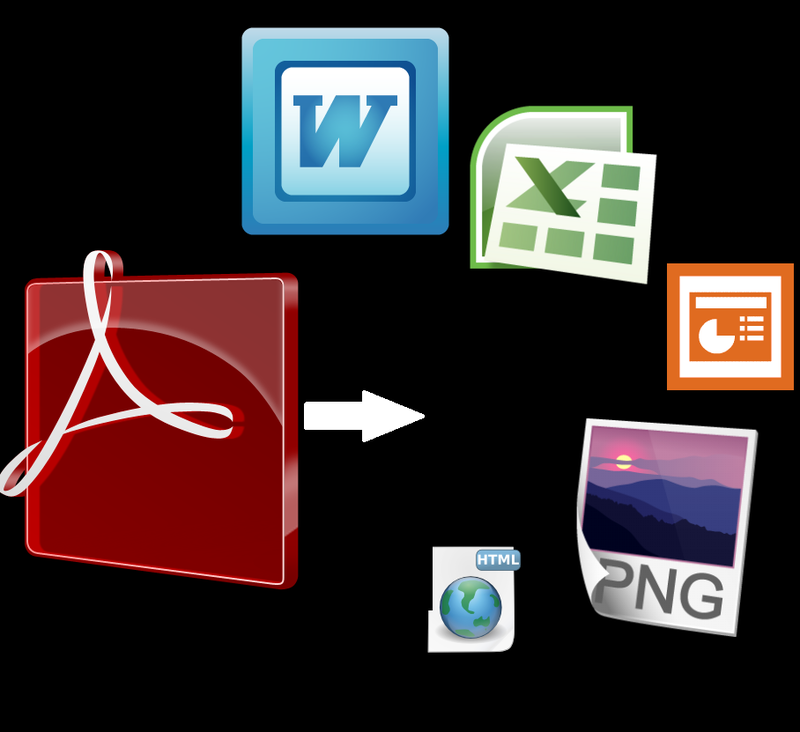 I give you 5 Online Tools that can convert word, PowerPoint, images, Web Pages and other files to PDF. This online tool can convert various files such as document processing files, images, web pages, and other files to PDF easily and comfortably. 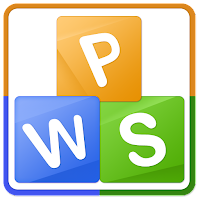 The supported formats that can be converted to PDF are doc, docx, dot, dotx, wpd, wps, wri, txt, log, csv, xls, xlxz, xlt, bmp, gif, png, and many more. You can also convert PDF files to Word, Excel, PowerPoint, and by E-mail. With Neevia document converter, you can instantly convert many file formats like doc, xlz, ppt, tiff, jpg, png, etc. without installing anything on your computer. Simply upload the file and select your output format. The output can be delivered can be downloaded within your browser or can be sent as an e-mail. You can even encrypt the document and watermark it with a text. This service is absolutely free which can produce high-quality PDF conversions. 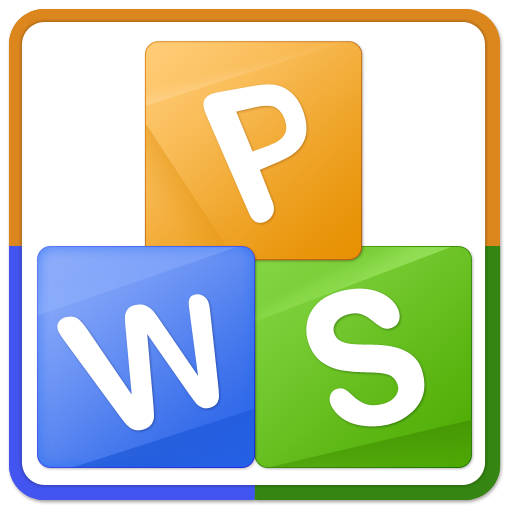 You don’t need to have MS word on your PC as its server can convert the file itself and produce PDF documents. The pictures in the word, excel or PowerPoint documents are preserved after the conversion. You can convert multiple files at once without any trouble. You can switch to another server, if the current server is taking a long time. 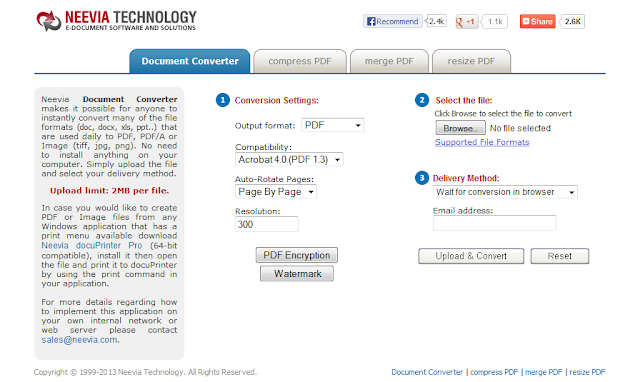 This online PDF converter has the ability not only to convert files to pdf, but also to edit, merge and unlock them. If the PDF file is read-protected, then you have to specify the required PDF password. 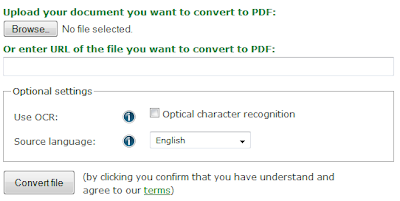 Before you convert the file to PDF, you can customize the display, image and security settings such as zoom, page layout, image quality, image resolution, page orientation, page margin, password, lock printing/copying/modifying, etc. The maximum file size that can be uploaded is 50 MB. The supported file formats are xps, rtf, txt, jpg, gif, png, bmp, tif, docx, doc, xlsx, xls, pptx, ppsx, pub, ods, odt, odf, and many more. 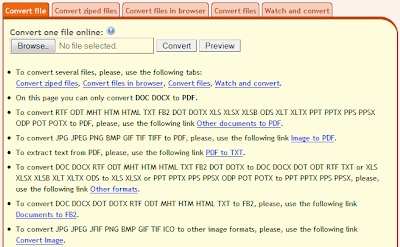 You can convert documents and images to PDF with this free online PDF converter as well as capture screenshots of a website. A searchable PDF file can be converted using the OCR (Optical Character Recognition). 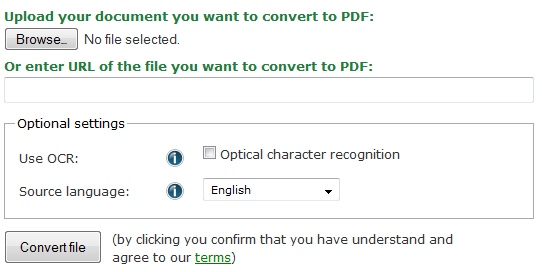 You can check this option before converting the document. Whenever we come across the topic “Office Suites”, the first name that arrives to our mind is Microsoft Office. Undoubtedly, MS Office has been the most popular and top software for desktop applications, servers, and services. But, there are some other softwares which really are productive and offers almost the same features and performance as MS Office. Kingsoft Office Free 2013 is one of those softwares which can process documents, analyze data and create quality presentations for free without sacrificing the computer’s performance. It is undoubtedly the best alternative to Microsoft Office and is completely free as well. Kingsoft Office Free 2013 has the blend of basic and advanced options to create documents, design presentations or make spreadsheets. The interface is completely organized and user-friendly that can be handled by even beginners within few minutes. It supports multiple tabs as a result the users be able to work on several projects simultaneously. The users can even encrypt and check spellings quickly without any hassle. The latest version 9.1 is lightweight unlike other office suites and has the smaller setup file of 40MB size, which is really appreciable. The brand-new interface supports the changing of skin colors of your choice. The document editing will easier and faster with the built-in Tab Management which simplifies the design. The user can Drag & Drop tables, adjust paragraph according the requirement. The Spreadsheets 2013 supports over 1,000,000 rows & 10,000 columns. Kingsoft Office Free 2013 offers three most important tools for document processing – Writer for word & text processing, Spreadsheets for creating, editing & analyzing data, and Presentations for creating quality slideshows easily and quickly. Let’s see about each of them in brief. 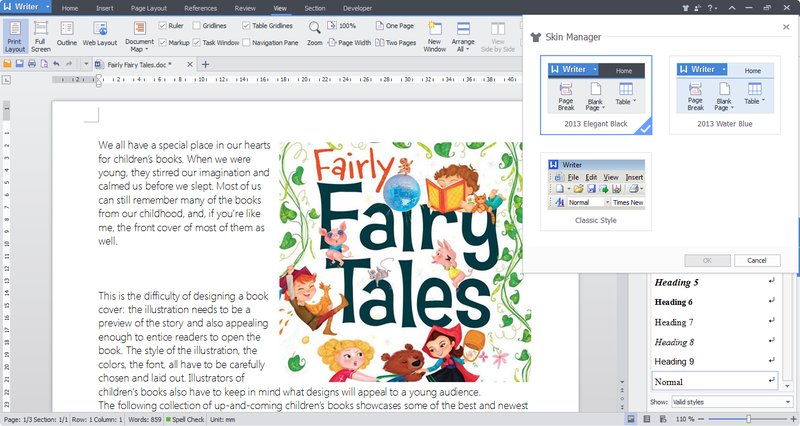 You can read & edit .doc and .docx format documents easily as Kingsoft’s Writer tool is highly compatible with all Microsoft Word 2007/2010 files. “Writer” tool is a dependable and fast word processing application which includes a section tab, paragraph adjustment tools and a cover page setting. The ‘Paragraph adjustment tool’ helps you to format and organize your word document layout easily than ever. Writer 2013 offers a variety of ‘colorful and data vibrant table styles’ which can be altered quickly and expediently. According to your preference, the interface can be switched between the ‘traditional and modern versions’ easily to have enhanced processing experience. The ‘Section Tab’ lets you arrange your paragraphs and change the document layout such as page numbers, section management, etc. 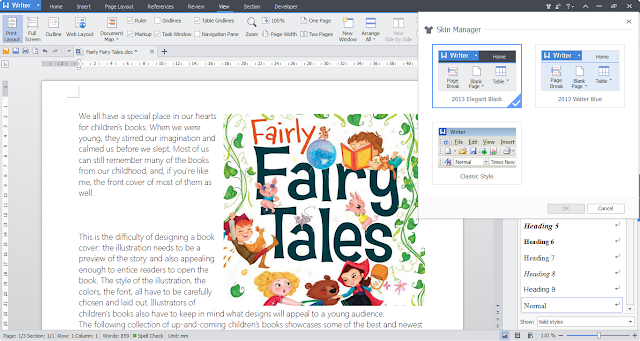 Writer 2013 offers various cover page styles to generate easy-to-read word document. You can place on cover pages without changing the paragraph layout without problems. The Spreadsheet app as you know can create, edit and analyze your personal and professional data with its different features, graphing tools, and complex data analysis. It is compatible with all MS Excel files such as xls, xlsx, csv, et and many more. It supports over 1,000,000 rows & 10,000 columns providing you with a greater control. ‘Spreadsheet 2013’ offers various online templates at startup that include unique themes such as business, education, office and resume. You can convert spreadsheets to PDF formats easily through its built-in PDF converter which is an advantage for professional users. You can share spreadsheets documents via Email. It provides over 100 commonly used formulas and functions for sorting, filtering, consolidating, conditional expressions, etc. You can switch between workbooks more conveniently with a multiple tab interface. You could convert huge amounts of text into hyperlinks to Internet, Email or other parts within the same document. The ‘Auto Contraction’ automatically summarizes the information and shows it in a discerning way. The ‘Encryption’ feature lets you enhance the document security with a strong password. You can create powerful and beautiful presentations with dynamic slides using flash, sound & animation effects, and ingenious backgrounds. The ‘PDF Converter’ can convert your presentation slides into PDF format easily. Presentation 2013 offers different background styles and templates in the category of business, education, etc. You can open multiple slide pages with tabbed-interface that will save you time in switching between various presentation documents. The ‘Spelling and Grammar Checker’ function let you proofread your documents. 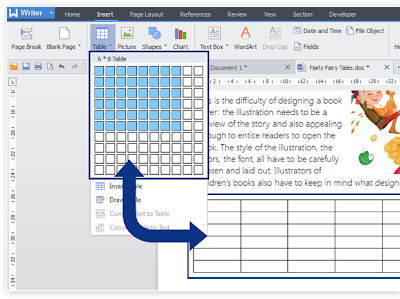 The ‘SmartArt Graphic Tab’ is newly introduced in Presentation 2013 that can read and insert into presentation slides to make it more stunning. Finally, Kingsoft Office Free 2013 seriously a best alternative to Microsoft Office with impressive and attractive tools that serves most users and saves money as well. Download Kingsoft Office Free 2013 which is compatible with Windows 8, 7, Vista and XP OS versions. You can upgrade to Kingsoft Office professional version just for $60. You can also download Android and iOS mobile versions from its official website. Some people habituated to read RSS and Atom feed for latest news for many years and for those, Desktop Ticker is a must-have application. Desktop Ticker is a free RSS and Atom web Feed application that brings you all the on-going stuff on your computer. This is a simple program developed where you can add your favorite website’s RSS or Atom feed, and the relative article titles scroll horizontally scroll across the screen. When you place the mouse cursor on any specific article title, the respective article summaries are displayed. If you wish to see the complete article, click on the article title and the webpage opens up in your default web browser. 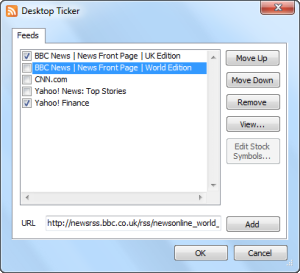 Desktop Ticker is an application in the Newsreaders & RSS Readers category, which can be downloaded for free. The latest version 1.7 has a new scroll left to right and generating custom color scheme automatically based on background color options. You can download either portable (zip) or installer (exe) from Desktop Ticker’s official website. The latest version is compatible with Microsoft Windows 7, Vista, XP, 2003, 2000, and Server 2008 versions. You have to install Microsoft .NET Framework 2.0 or above to run the application. Displays anywhere on the desktop with unobtrusive and user-friendly customizable interface. Displays RSS or Atom web feed of news, stocks, and other latest articles from any website which has subscribe or feed option. 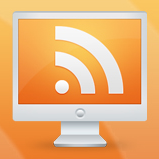 The RSS feeds are instantly downloaded after the précised interval to present updated content. You can manage or reload feeds via Compact Feed Manager, such as displaying just the RSS feed or just articles posted within a specific time, adjusting the scroll speed and changing the color coding depending the article posted period. Dock-style interface with small directional arrows at either end for quickly scrolling forward and back. 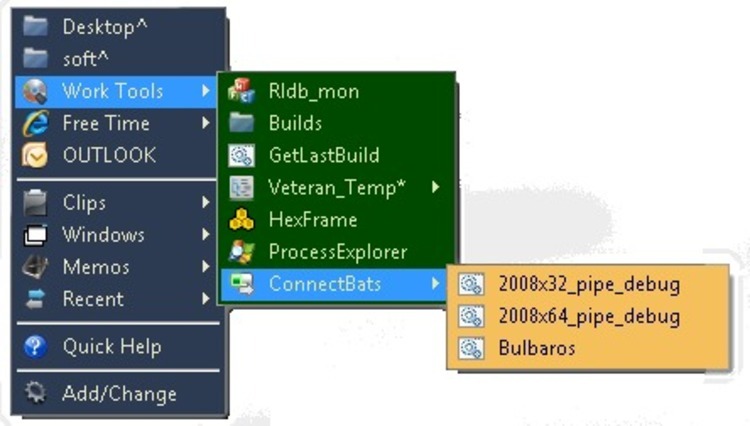 Can be synchronized with the Windows Common Feed List. The list of subscribed RSS feeds can be shared with other Windows applications such as IE, Live Mail and Outlook. Compatible with popular news sites such as BBC News, Yahoo! Finance and CNN, and other news feed sites like Gmail, Facebook, Flickr, etc. You can change the Opacity level, Speed through simple commands. Finally, Desktop Ticker is an old application in this modern tech world, but people who really care about stocks and finance can get very useful information absolutely free. If you wish to use a web browser only for performing online transactions with higher security, you could prefer Comodo Dragon. This internet browser offers you additional online security which you want to have at the time of sensitive operations like online shopping or banking. It is a freeware web browser that is based on Chromium technology and the interface is similar to Google Chrome. Comodo Dragon does not employ Google Chrome’s user tracking and other privacy-compromising features, whereas it provides extra protection measures such as authenticating with only SSL certificate websites. The other features of Chrome like Bug Tracking System, Google-hosted error pages, etc. are not available in Comodo Dragon. For users who search often daily, the application offers an automatic access to Google Search with Google as default search engine and automatic address bar search suggestions. 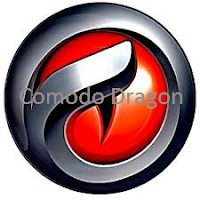 Comodo Dragon is a versatile web browser with unparalleled security and privacy levels. The latest version has few improvements such as web page loading time and graphics are rendered faster with improved start-up times. If there is any plug-in crash, you don’t have to restart the browser, but just refreshing the web page is enough. Upon installing Comodo Dragon, the user can configure either the web browser’s default options or the user’s whole computer to use Comodo’s own DNS servers as an alternative to default Internet service provider. As said earlier, the application checks websites for the SSL digital certificates for security measures. 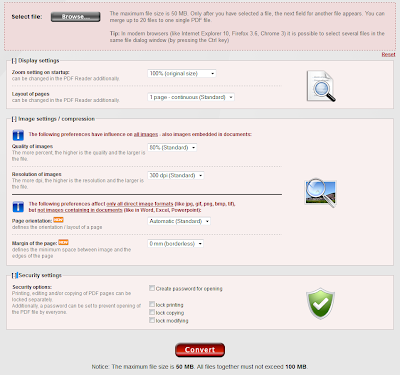 It offers an on-demand site inspector to verify if a site hosts malicious code. Its built-in updater installs everything the application needs automatically. Enhanced Privacy over Chromium technology. Identifies SSL certificates easily when the website loads via Domain Validation technology. Consumes less memory and offers Greater Stability. A Private Browsing Mode called “Incognito” blocks cookies and other codes to improve privacy. Total Security from Malware and its related threats. Surpasses privacy enhancements offered in Chromium’s technology. Does not send browsing information to a remote server. The interface is very identical to Google Chrome with detachable tabs at the top of the screen, bookmark-sync option & Options menu on the right-side. The Extensions and Help tab takes the user to Google Chrome’s respective pages. There is no option to send “usage statistics and crash reports to Google.” The other things such as download manager, password manager, developer tools, theme support, etc. are quite similar to Google Chrome. It provides firewall software to block unsafe or non-secure web pages, putting a warning message that the sending information may be unsafe when entering a website with an unstable security certificate. For those, who really concern about their online security and privacy, prefer Comodo Dragon to Google Chrome as it offers extra security to your online identity and social networking practice. You may be copying data from various resources or downloading huge amounts of data like videos, songs, softwares, files, etc. but have you wondered what quantity of your hard drive is taking up all that space and what amount is being wasted? To know this data, you need to scan and analyze your hard disk space thoroughly. 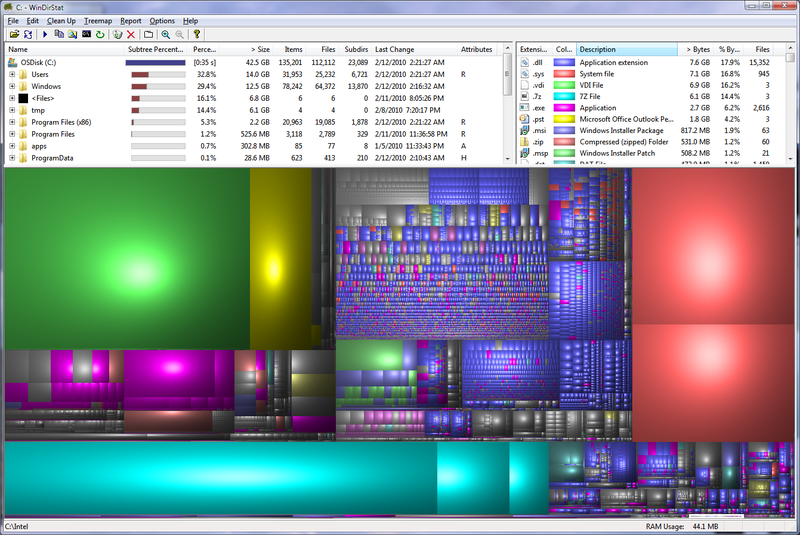 WinDirStat is a powerful solution for analyzing the disk space on your hard drive. It gives you the statistics of the disk as well as cleaning up your system in all sorts. WinDirStat presents a colorful graphical display of a sub-tree view with disk use percentage along with the list of file extensions. This is an open-source tool developed using Visual C++/MFC 7.0 version, inspired by KDirStat, a Linux KDE application. The first version was released in October 2003, but the most recent release was in September 2007. Since that there has been only little enhancement in the development. WinDirStat is available in ZIP format which could run on all Windows OS platforms except Windows 8. You can download WinDirStat from its official website or from SourceForge, a popular open-source download center. It scans one or more disks or just a folder to analyze. It creates a color-coded clickable map of the data on your disk. When you click on an item or specific data on the map, it provides extra information about that. Delete specific folders which are taking more unnecessary space directly from WinDirStat’s interface. Shows complete information about any file or folder you choose. Filters your entire disk by file/folder size or extension so that you can view the largest space hogs. Assigns colors to file types such as MP3, ZIP, EXE, JPG, and many more. Offers zooming option to view any item. Offers built-in cleanup actions such as Open, Show Properties, Delete. Depending on your operating system, WinDirStat opens in either ANSI or Unicode version. Alongside the advantages, WinDirStat is a bit slow on older configuration computers because of the colorful graphical user interface. A portable version is available for download which can be downloaded from here. The interface is simple and once you run the program, it allows users to select the drive they choose to be analyzed. Once the process gets done, the complete details are shown about disk usage such as percentage, size, last modification data & time, attributes, number of files and subdirectories. Finally, WinDirStat offers powerful features which prove to be a dependable tool that helps you to analyze the disk space on your hard drive. ACDSee Pro 6 is a professional way to edit photos which allows you to enhance productivity by photo editing, organizing, viewing, and sharing. 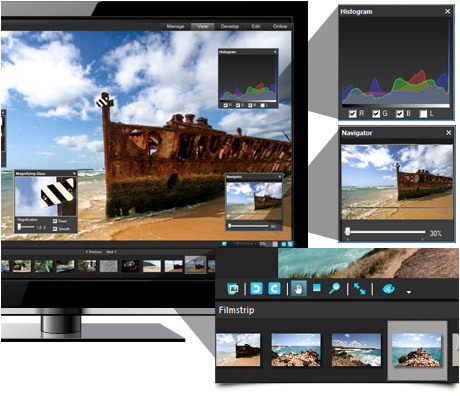 It includes powerful photo editing tools that let you securely store images online and process them whenever you want. It is developed for expert photographers, but novices can also make it purposeful with a quick start guide that has enough editing techniques. 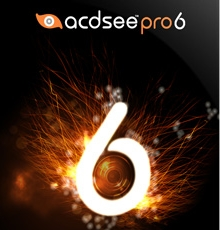 As ACDSee Pro 6 is a professional version, the complete software should be purchased for $149.99, an expensive one but worth trying. A 30-day trial subscription is also offered which contains the software’s full features. The pro version is a bit expensive, but you will get the bonus online storage space which many photo editors can’t manage to offer. 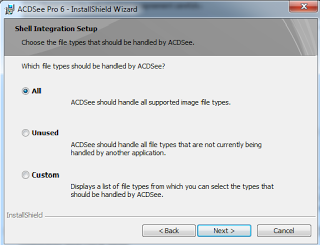 The 32-bit and 64-bit versions of ACDSee Pro 6 are compatible with Windows 8, 7, Vista and XP with no issues. The installation offers three options for handling file associations – all image file types; only unassociated types; and custom settings to choose file types. You need to create an account or sign-in with existing username and password to access online tools and storage space. A quick startup guide will illustrate briefly about the application’s tools and features. The interface resembles the top photo and image editors featuring a sophisticated alignment. The main interface is divided into five main sections – Manage, View, Develop, Edit, and Online. You can browse for images or drag and drop method through ‘Manage’ section. You can filter, group, sort, and select images by rating, labels, file name, size, image type, etc. In the ‘View’ section, you can add, rotate, magnify, scroll, or zoom pictures to the image. You can even set captions, access external editing tools, view slideshows, insert audio, set file associations, and more. The Developing tools hold advanced settings such as lighting, advanced colors, highlight hue & saturation, shadows hue, balance & saturation, and tone curves. You can apply special effects and editing tools such as watermark, text, red eye reduction, collage, orton, crop, sharpen, blur, noise, dodge, perspective correction, exposure and lighting, vignette and burn. In the ‘Online’ section, you can create password-protected albums and folders on the developer’s website and share them with others. Improved Workflow – The new version has super fast performance, hierarchical keywords, enhanced color management, Blu-ray burn support. Photo Developing – You can make non-destructive adjustments to get the look precisely you want. The improved noise reduction and sharpening rescues your high ISO images to get more natural results. Black and White mode makes high-quality non-destructive hue-based brightness adjustments and saturation-based tinting. New processing tools and Advanced Color Improvements. 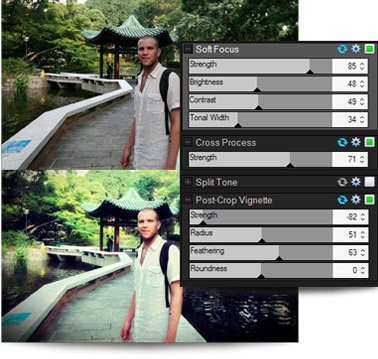 Photo Editing – Add brush effects on specific area of your photo and apply the new Smart Blur filter in Edit mode. Streamlined Digital Asset Management increases the speed and performance of the workflow. 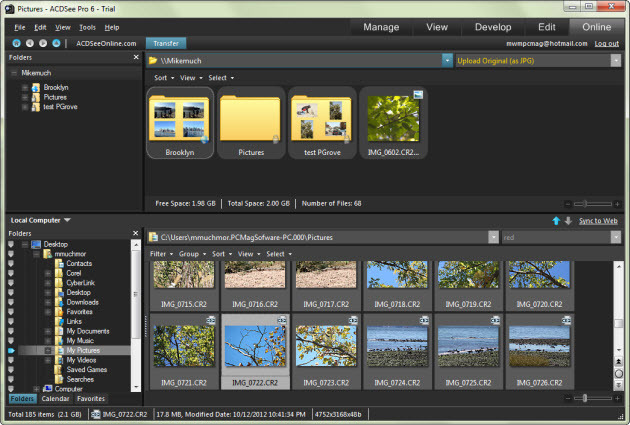 You can take control of all your digital image assets with an organized collection and metadata. You can find any image in your collection with the ‘Powerful Search Tools’ based on metadata, file properties, date, event, rating, keyword, and many other attributes. Display your photos in real-time i.e. precisely the way you want, from their original locations. You can see your images at full resolution with a single click. Make your edited photo even better with non-destructive adjustment brushing techniques, tuning your images, reducing noise, sharpening images smartly, creating stunning HDR images and turning on to black and white mode. You can edit multiple photos at once using ‘Batch Edit’ mode. You can rotate, crop, resize, add watermarks, and perform several operations simultaneously. Instantly preview the applied effects. Apply more than 45 unique effects including the create Collage and Orton effects. Your free account includes 10 GB of online storage, so that you can backup your images easily and share them with Facebook and Twitter contacts. You need to have minimum 1 GB RAM and 1 GB hard disk space with 1280x1024 screen resolution to install the application. A CD/DVD Burner is required to burn images to CDs and DVDs if you wish to. Coming to the software requirements, you require at least Microsoft Internet Explorer 7, DirectX 9.0c, and Windows Media Player 9.0. Finding difficult to manage your huge list of music and movies located on a hard drive or a network? MediaMonkey shows you the proper direction to resolve this difficulty. 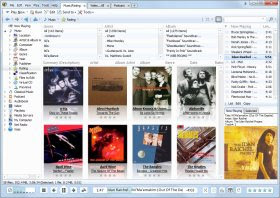 MediaMonkey is the media manager that organizes your audio and video files, rips CD/DVD, manages podcasts, and builds your library with the music/movie downloader. The files are organized in a customized fashion such as classical music, videos, TV, home movies, contemporary, audiobooks, etc. not depending on its location. MediaMonkey organizes over 100,000 music and video files without making the list look awkward. It comes handy when playing, burning, tagging, and organizing music of various popular formats. You can create playlists easily than before and you can quickly locate any song with the help of tagging. The advanced playlist management balances a player that automatically adjusts volume levels. The user interface hosts a lot of functions and for beginners it gets some time to get used to. The built-in converter supports many multimedia devices which include Android, iPhone, iPad, TV, DLNA supported DVD players, etc. 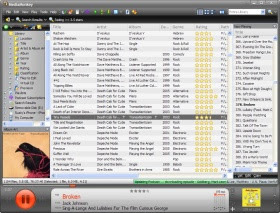 The supported conversion formats are MP3, M4A, OGG, FLAC, WMA, MP4, AVI, and WMV. You can sync or share through devices via DLNA support. The new version 4.0.7 has a trivial update that adds support for the iPhone 5/iPod Touch 5G, iOS 6 and the iPod Nano 7G. The update also includes Android synchronization tweaks and Windows 8 compatibility. Your computer must have a good sound card to utilize MediaMonkey comprehensively. MediaMonkey’s music & movie organizer is a handy feature for serious collectors. It manages a music/movie library and playlists depending upon Genre, Artists, Year, Rating, etc. making it easier to browse or search. It shows the thumbnails of the collected media. 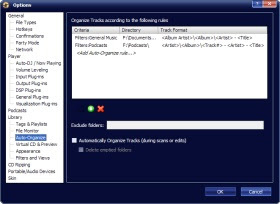 You can identify tracks and movies that are missing information or whether the tags are duplicated or not synchronized. It provides Automatic Lookup and Tagging to fix tags of album art by collecting the information from Amazon, Allmusic, Freedb or via CD-TEXT. The program makes it simpler to update your tags faster with accuracy. 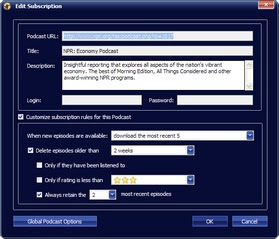 The program provides many tag editor based on the industry-standard formats such as MP3 Tag editor, AAC, OGG, WMA, APEG2, RIFF, and MP4 tag editor. With the help of these editors, you can easily update and correct mislabeled tracks, set ratings, mood, and other information. You can assign advanced attributes to your music such as composer, original year and album, lyrics, etc. The Auto-Tagger intelligently tag files based on filenames. MediaMonkey’s Auto-organizer instead of storing your files in a random manner, it categorizes them into filenames and folders of your choice based on artists, album, track title & number, series, season number, and episode number. The Movie/Music organizer can manage a media collection over 10,000 files easily. You can create playlists effortlessly with a combination of mp3s and videos from your library. You can create Auto-Playlists based on specific criteria, or use the Auto-DJ which creates a mix of selected songs for you automatically. The playlists you have created will remain unbroken whether you rename or retag files in it. You can export your playlists to other devices or players via m3u files. The Web Downloader gets media files from any website by defining your subscription package. The integrated Podcatcher downloads the audio content of podcasts. The Skins, visualizations, plug-ins and other add-ons makes you to control to customize and control MediaMonkey easily. 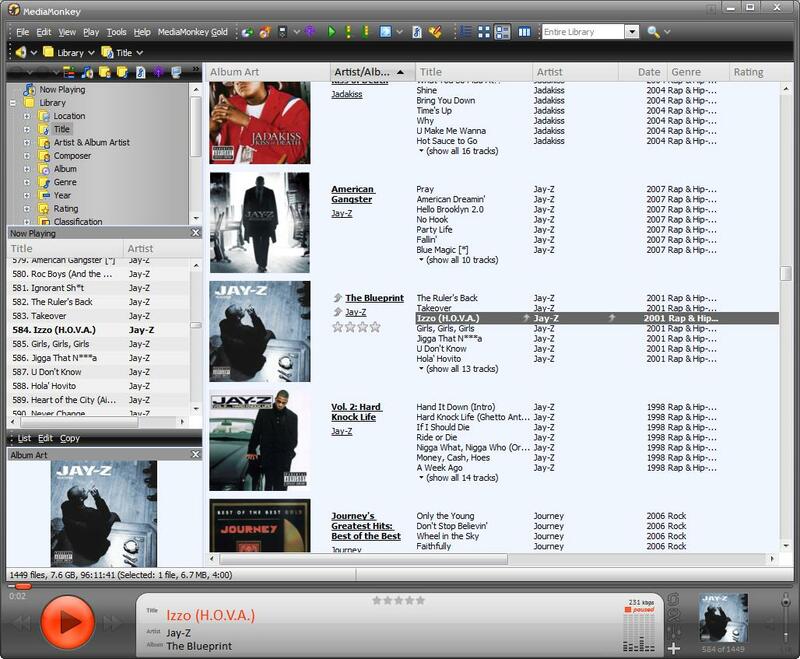 The program can integrate with other applications such as sound editors, metadata lookup add-ons, customized reports or views, and custom Auto-DJ rules. 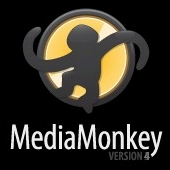 The add-ons can be downloaded which extends MediaMonkey’s functionality. MediaMonkey supports various digital audio files such as MP3, AAC/M4A, OGG, WMA, MPC, APE, FLAC, WAV, WMV, AVI, MP4, MKV, etc. for playback. The volume levels are adjusted automatically using Replay Gain and MP3 Gain technology. You can even play audio CDs. The CD Ripper copies of the CDs and automatically fills the track properties via freedb. You can record CDs to your hard drive using the high-quality encoders. The built-in converters can convert audio/video files to various media formats and preserve tag information. With the integrated burner PrimoBurner, it burns audio CD/DVD/BDs. Use MediaMonkey’s Jukebox mode for parties which lets you to make requests at the same time protecting your library from being modified. The hundred of visualization plug-ins and effects powered by Milkdrop makes your music. Apart from the above features, you can sync or backup iPhones, iPads, iPods, Android, and other devices. You can even share audio/video files with TVs, Blu-ray Players, and other UPnP/DNLA devices. Using the File Monitor, you can automatically update your media library that instantly reflected in the same as well. You can create Statistics and other Reports of your music collection as Excel, HTML, or XML files. You can download MediaMonkey which is a comprehensive audio management solution that organizes your media collection well with its huge configuration possibilities and playback capabilities. Get MediaMonkey Gold, if you want to have advanced features like unlimited MP3 Encoding, Virtual CD/Previews, Sleep Timer, Automatic Library Organizer, etc.